An eyewitness to the school shooting in Maryland said that he barely escaped with his life. 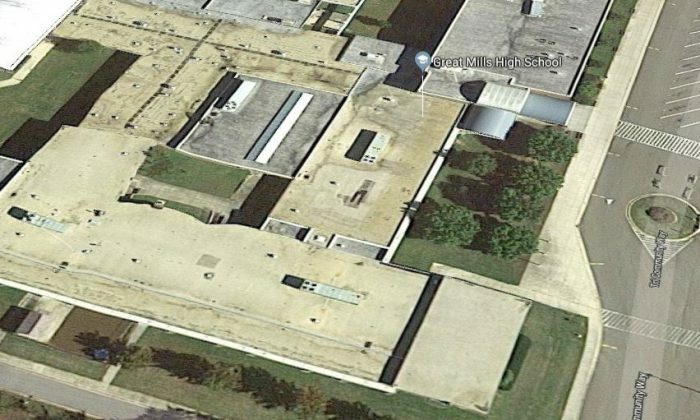 Terrence Rhames, a senior at Great Mills High School, said that he was standing with his friends outside of their first-period class around 8 a.m. when he heard a gunshot. He knew immediately he had to flee. Rhames, a track and field athlete, said that he started running, but turned around when he realized he was headed towards a dead-end. As he turned to sprint toward the nearest exit, he saw a girl fall out of the corner of his eye, he told The Baltimore Sun. Mollie Davis, 17, was in her classroom when she heard a gunshot. “I was in my classroom upstairs, which is next to the stairs. I heard what sounded like a balloon pop and commotion. I thought it was a fight as did my class. A few of them ran out to see and then ran back in saying someone yelled ‘gun’ and people were running out of the school,” she told Buzzfeed. Another student, Jonathan Freese, spoke to CNN while on lockdown in his math class. Freese said that police officers were going through classrooms and students were told that they would be escorted out of the building when the rooms were cleared. Freese said that the school has held drills a couple of times in the past for active shooter situations. “I didn’t really expect for this to happen. I do always feel safe, though, because they always have police at the school,” he said. St. Mary’s County Sheriff spokeswoman Cpl. Julie Yingling told The Associated Press that there were three injured in the shooting, including the shooter. She also said there were no confirmed fatalities. A report indicated that the school resource officer ended the situation by confronting the shooter. Maryland Gov. Larry Hogan said via Twitter that officials are “closely monitoring the situation” at the high school. “Maryland State Police is in touch with local law enforcement and ready to provide support. Our prayers are with students, school personnel, and first responders,” he said. St. Mary’s County Public Schools said around 10 a.m. that students were being evacuated from the high school and bused to the reunification center at the Leonardtown High School campus. Great Mills, which has about 1,600 students, is around 60 miles southeast of Washington, D.C., and about 90 miles outside of Baltimore.